Verdict - A movie which deserves to rank high in the surprises of 2017. Suddenly at the fag end of 2017 , Bollywood is making up for a dull year. Rukh has come out of nowhere but if you love cinema of mature emotions presented in the right subtle manner you will absolutely love Rukh. Story of a young boy who becomes a man when thrown one of the biggest challenges any teenager can face - the demise of the strongest pillar of his family , his father ! Rukh is a story of hope and how human strength will ultimately always triumph over odds. A young rebellious boy is suddenly called back to his home when his father dies in a suspicious car accident. The boy Dhruv has his own inner demons and the new situation adds to his own turmoil. How the boy hangs in there with grit and pursues a truth which is far darker than he could have ever imagined. However once the truth is broken to him he emerges even stronger. The last scene where he walks up to own up for a situation which is not necessarily totally his doing is stuff of subtle strong cinema. Dear Atanu Mukherjee take a bow! Rukh is the story of humans who faced with challenges take their own different paths. Therefore the title is probably not just an indicator of the rukh (attitude) of one individual Dhruv. It is how certain others like Diwakar (played by Manoj Vajpayi) his friend Robin (Kumud Mishra) and his mother Nandini (Smita Tambe) face up to those unfair or fair challenges and chose their own path. Father takes a decision which might not be digestible for some but probably the best way out. The friend is a typical dark guy with a predictable behaviour with shades of grey. The mother chooses the path of being a stoic and moving on. Rukh is one of the better made intellectual movie which deserves all the awards that are coming its way. May I say the first movie of 2017 which deserves the tag of intellectual cinema totally. A mention of Rukh cannot be complete without mentioning the great effort of some its other lead characters. Manoj Vajpayi is very competent as the trapped in situations beyond his control Diwakar. Kumud Mishra as Robin does his job of the dark guy with remarkable efficiency. Smita Tambe as Nandini is pure gold performance most of the times she emotes with eyes as the trapped wife and she is so brilliant - probably the show stopper performance of the film is Nandini. A woman whose stoic attitude is misunderstood by us in the audience as spinelessness only to realise that she was actually the bravest of all four characters. She actually walks away with your respect as a character. Adarsh Gourav can be labelled as the find of 2017. His one dimensional dark role in Mom was good but his delivering of the brooding Dhruv who chooses the right path over darkness is stuff of legends , he is very young and given the right director this young man is the next big thing. Remember you read it here first. Do not miss Rukh , Bollywood is in big time creative mode with this one. 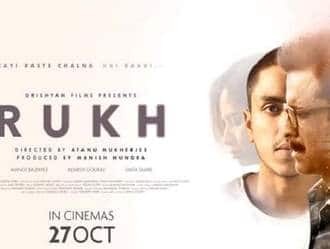 Rukh is a rare movie where no scene is above 30 seconds and none has even smiled.With a run time of around 100 minutes ,200 scenes have been edited to showcase a thriller which grows on the viewer till the near end. What's the plot? Robin ( Kumud Mishra) and Diwakar Mathur ( Manoj Bajpai) are business partners in a leather manufacturing factory.The outfit has fallen into debts.Is it because of a slump in the business or the ulterior design of Robin? A CBI enquity is on against the outfit,the eye of suspicion is against Robin.The workers are restive against the owners for their plight.Diwakar being honest has taken a huge loan to tide over the crises on the assurance that Robin would repay the same in due course. Meanwhile Diwakar is shown to have been killed in a car accident.Is it a case of hit and run? is it because of drink driving ? or else? Go see for your self. Dhruv Mathur ( Adarsh Gourav),the boarding school son of Diwakar has returned to unravel the mystery .Does he succeed? Why is her office going mother Nandini( Smita Tambe) unconcerned? The mystery is revealed in the climax. The characterisations: Robin is cunning.Diwakar is too honest.Dhruv suspects Robin.But is it so? Several characters are shown,some could also be ' suspects' in the ' crime'.Nandini is quite for she alone knows the truth. Performances: All are natural and tops. Direction:Atanu Mukherjee would go miles. Editing : Mystery is maintained till the end. Kya Scene Hai- when Robin visits the house of the accountant Jayant( Shubhrajyoti Barat) to warn him to keep mum during the CBI enquiry; when Robin and Diwakar are at the beach to confide in one another;when Dhruv confronts the truck driver with a toy pistol . General observations - bullying and intimidation does take place in schools,the drop out rate among senior students and their inclination towards crime,bribe being discreetly offered to traffic cops,innovative ways in which insurance policies get used. This film reminded me so much of Udaan, emotionally. It is sad when a movie of such high calibre has no publicity, and to add insult to injury, gets a delayed release. The first half of Rukh was good. Though slow, it's realistic and the tremendous acting of the entire cast takes the film exponentially higher. Manoj Bajbayee is so good to watch, and you sincerely wish to see more of him. What a talent! And that guy who plays his son - the protagonist - is a revelation. Yes, Adarsh Gourav has arrived, and how! The story is through the eyes of Dhruv Mathur, a teenager who comes back home from boarding school. His father, Divakar, is killed in a car accident, and weird events unfold that makes the son suspect foul-play. Debutant director Atanu Mukherjee makes a remarkable debut. He is controlled and draws out impeccable performances from his cast. Not only is this a whodunit film, it is more so a tale of coming to terms with one's loved ones and the self, about betrayal in friendship, and the stress involved in running your own business, especially when things go awry. The director has depicted all this beautifully. The second half of the film was even better. And the music, plus the background music, is terrific. Amit Trivedi doesn't disappoint, and the title track is apt. His music is given life by the playback singing of Arijit Singh and Mohan Kannan. The lyrics by Sidhant Mago are pretty convincing. Special mention for Smita Tambe, too, who, through her expressions, shows her state of helplessness and pain. Good to see more and more of such realistic films come out. Much needed. Seriously makes me want to make a film. Just need a story! Films are so good technically these days. My verdict: 4.5 out of 5. Too bad this did not have the backing of a 'known' superstar, and is hidden away like a secret. Pun intended!